Views on Marriage and Mourning. Attitude Toward Abraham ibn Ezra. Spanish Talmudist, exegete, and physician; born at Gerona (whence his name "Gerondi") in 1194 (Gans, "Ẓemaḥ Dawid," p. 50, Warsaw, 1890); died in Palestine about 1270. 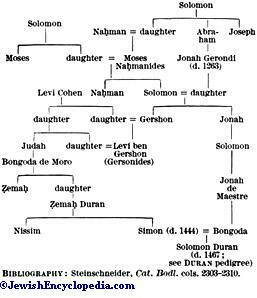 He was the grandson of Isaac ben Reuben of Barcelona (Simeon ben Ẓemaḥ Duran, Responsa, i., § 72) and cousin of Jonah Gerondi; his brother was Benveniste da Porta, the bailie of Barcelona (Jacobs, "Sources," p. 130). Among his teachers in Talmud were Judah ben Yaḳar and Meïr ben Nathan of Trinquetaille, and he is said to have been instructed in Cabala by his countryman Azriel. Besides rabbinics, Moses studied medicine, which later he practised as a means of livelihood; he also acquired an extensive knowledge of philosophy. He was not far beyond the age of puberty when his name began to be counted among the Talmudical authorities of his time. In his sixteenth year he commenced to compose compendiums of some parts of the rabbinical law, following the methods of Isaac Alfasi; and in a work entitled "Milḥamot Adonai" he defended Alfasi's Talmudical decisions against the criticisms of Zerahiah ha-Levi of Gerona. These writings, distinguished by great acumen and profundity, reveal that conservative tendency which became a distinguishing characteristic of Moses' later works—an unbounded respect for the earlier authorities. To him the wisdom of the ancients was unquestionable, and their utterances were to be neither doubted nor criticized. This reverence for authority Moses extended even to the Geonim and their immediate disciples, up to Alfasi. "We bow," he says, "before them, and even when the reason for their words is not quite evident to us, we submit to them" ("Asifat Zeḳenim" to Ketubot). 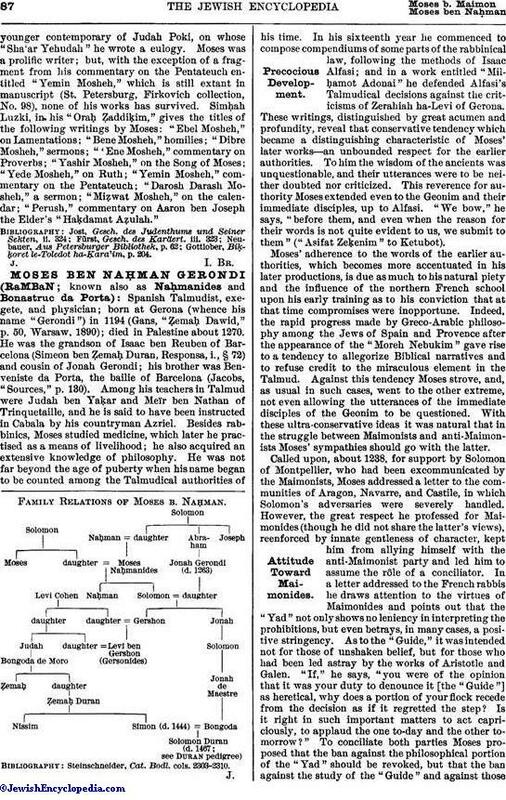 Family Relations of Moses b. Naḥman. Steinschneider, Cat. Bodl. cols. 2303-2310. Moses' adherence to the words of the earlier authorities, which becomes more accentuated in his later productions, is due as much to his natural piety and the influence of the northern French school upon his early training as to his conviction that at that time compromises were inopportune. Indeed, the rapid progress made by Greco-Arabic philosophy among the Jews of Spain and Provence after the appearance of the "Moreh Nebukim" gave rise to a tendency to allegorize Biblical narratives and to refuse credit to the miraculous element in the Talmud. Against this tendency Moses strove, and, as usual in such cases, went to the other extreme, not even allowing the utterances of the immediate disciples of the Geonim to be questioned. With these ultra-conservative ideas it was natural that in the struggle between Maimonists and anti-Maimonists Moses' sympathies should go with the latter. Called upon, about 1238, for support by Solomon of Montpellier, who had been excommunicated by the Maimonists, Moses addressed a letter to the communities of Aragon, Navarre, and Castile, in which Solomon's adversaries were severely handled. However, the great respect he professed for Maimonides (though he did not share the latter's views), reenforced by innate gentleness of character, kept him from allying himself with the anti-Maimonist party and led him to assume the rôle of a conciliator. In a letter addressed to the French rabbis he draws attention to the virtues of Maimonides and points out that the "Yad" not only shows no leniency in interpreting the prohibitions, but even betrays, in many cases, a positive stringency. As to the "Guide," it was intended not for those of unshaken belief, but for those who had been led astray by the works of Aristotle and Galen. "If," he says, "you were of the opinion that it was your duty to denounce it [the "Guide"] as heretical, why does a portion of your flock recede from the decision as if it regretted the step? Is it right in such important matters to act capriciously, to applaud the one to-day and the other tomorrow?" To conciliate both parties Moses proposed that the ban against the philosophical portion of the "Yad" should be revoked, but that the ban against the study of the "Guide" and against thosewho rejected Talmudical interpretation of the Bible should be maintained and even strengthened. This compromise, which would have ended the struggle, was rejected by both parties in spite of Moses' great authority. The respect for authority which prompted Moses to defend Alfasi also caused him to undertake the defense of Simeon Ḳayyara, author of the "Halakot Gedolot," against the criticisms formulated by Maimonides in his "Book of Precepts." In the latter defense, written at a more mature age, the author shows himself less intolerant than in the "Milḥamot," and abandons Maimonides where fully convinced that the latter is wrong. "Notwithstanding," he says in the introduction, "my desire to follow the earlier authorities and to assert and maintain their views, I do not consider myself a 'donkey carrying books.' I will explain their methods and appreciate their value, but when their views can not be supported by me, I will plead, though in all modesty, my right to judge according to the light of my eyes." It is noteworthy that, notwithstanding his conservatism, he considers the saying of R. Simlai (See Commandments) upon which the belief that there are 613 commandments is based to be merely homiletical. After having given the earlier part or his life to his Talmudical works (see below), Moses devoted himself to writings of a homiletic-exegetic and devotional character. To these belong the "Iggeret ha-Ḳodesh" and the "Torat ha-Adam." In the former, which deals with the holiness and significance of marriage, Moses criticizes Maimonides for stigmatizing as a disgrace to man certain of the desires implanted in the human body. In Moses' opinion, the body with all its functions being the work of God, none of its impulses can be regarded as intrinsically objectionable. In the "Torat ha-Adam," which deals with mourning rites, burial customs, etc., Naḥmanides sharply criticizes the philosophers who strove to render man indifferent to both pleasure and pain. This, he declares, is against the Law, which commands man to rejoice on the day of joy and weep on the day of mourning. The last chapter, entitled "Sha'ar ha-Gemul," discusses reward and punishment, resurrection, and kindred subjects. It derides the presumption of the philosophers who pretend to a knowledge of the essence of God and of His angels, while even the composition of their own bodies is a mystery to them. For Naḥmanides, revelation is the best guide in all these questions; but as he is not, he says, a despiser of wisdom, one who would systematically refuse to resort to speculation for the corroboration of faith, he purposes to discuss them rationally. As God is immanently just, there must be reward and punishment. This reward and punishment must take place in another world, for the good and evil of this world are relative and transitory. Besides the animal soul, which is derived from the "Supreme Powers" and is common to all creatures, man possesses a special soul. This special soul, which is a direct emanation from God, existed before the creation of the world. Through the medium of man it enters the material life; and at the dissolution of its medium it either returns to its original source or enters the body of another man. This belief is, according to Moses, the basis of the levirate marriage, the child of which inherits not only the name of the brother of his fleshly father, but also his soul, and thus continues its existence on the earth. The resurrection spoken of by the Rabbis, which will take place after the coming of the Messiah, is referred by Moses to the body, which may, through the influence of the soul, transform itself into so pure an essence that it will become eternal. A better insight into Moses' theological system is afforded by his commentary on the Pentateuch, which is justly considered to be his chef-d'œuvre. 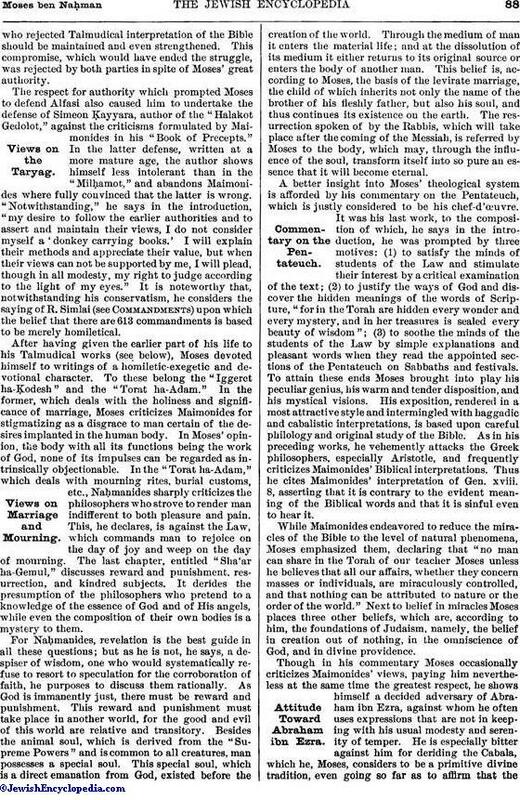 It was his last work, to the composition of which, he says in the introduction, he was prompted by three motives: (1) to satisfy the minds of students of the Law and stimulate their interest by a critical examination of the text; (2) to justify the ways of God and discover the hidden meanings of the words of Scripture, "for in the Torah are hidden every wonder and every mystery, and in her treasures is sealed every beauty of wisdom"; (3) to soothe the minds of the students of the Law by simple explanations and pleasant words when they read the appointed sections of the Pentateuch on Sabbaths and festivals. To attain these ends Moses brought into play his peculiar genius, his warm and tender disposition, and his mystical visions. His exposition, rendered in a most attractive style and intermingled with haggadic and cabalistic interpretations, is based upon careful philology and original study of the Bible. As in his preceding works, he vehemently attacks the Greek philosophers, especially Aristotle, and frequently criticizes Maimonides' Biblical interpretations. Thus he cites Maimonides' interpretation of Gen. xviii. 8, asserting that it is contrary to the evident meaning of the Biblical words and that it is sinful even to hear it. While Maimonides endeavored to reduce the miracles of the Bible to the level of natural phenomena, Moses emphasized them, declaring that "no man can share in the Torah of our teacher Moses unless he believes that all our affairs, whether they concern masses or individuals, are miraculously controlled, and that nothing can be attributed to nature or the order of the world." Next to belief in miracles Moses places three other beliefs, which are, according to him, the foundations of Judaism, namely, the belief in creation out of nothing, in the omniscience of God, and in divine providence. 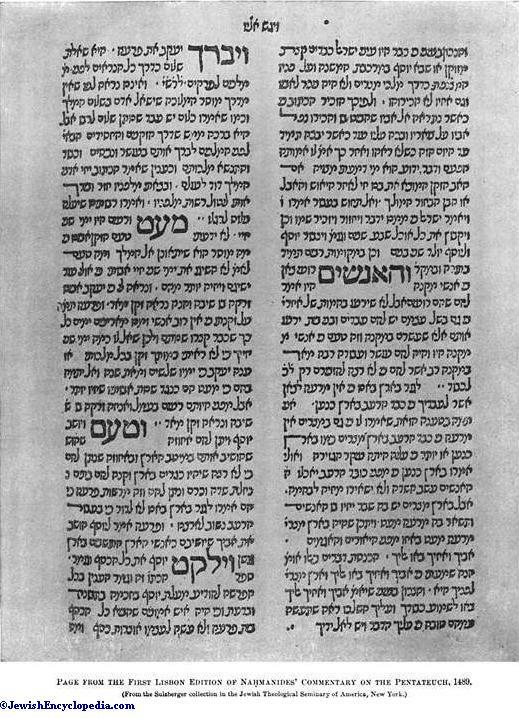 Page from the First Lisbon Edition of Naḥmanides' Commentary on the Pentateuch, 1489. Though in his commentary Moses occasionally criticizes Maimonides' views, paying him nevertheless at the same time the greatest respect, he shows himself a decided adversary of Abraham ibn Ezra, against whom he often uses expressions that are not in keeping with his usual modesty and serenity of temper. He is especially bitter against him for deriding the Cabala, which he, Moses, considers to be a primitive divine tradition, even going so far as to affirm that the whole text of the Torah is a succession of mystical names of God. Yet, notwithstanding his great veneration for the Cabala, he uses it with moderation in his Biblical exposition, and in his introduction advises the reader not to meditate over the mystical hints scattered through his works, for "one can not penetrate into the mysteries of the Cabala by independent thought and reflection." Moses' share in the development of the Cabala, though universally recognized, was rather moral than literal; he sanctioned it by the great authority of his name, but not by any contributive activity. Even the name of cabalist can hardly be applied to him, for he professed the dogma of "creatio ex nihilo" and insisted that attributes can be ascribed to God. The characteristic features of Moses' commentary are the lessons which he draws from the various Biblical narratives, in which he sees adumbrations of the history of man. Thus the account of the six days of Creation constitutes a prophecy of the events of the following six thousand years, and the seventh day is typical of the Messianic millennium. Jacob and Esau are the prototypes of Israel and Rome, and the battle of Moses and Joshua with the Amalekites is a prophecy of the war which Elijah and the Messiah ben Joseph will wage against Edom (Rome) before the arrival of the Messiah ben David, which was fixed by the commentator for the year 1358. Moses, first as rabbi of Gerona and later as chief rabbi of Catalonia, seems to have led a quiet and happy life, surrounded by his family and numerous pupils, and enjoying a universal reputation. When well advanced in years, however, this peaceful and ordered life was interrupted by an event which compelled him to leave his family and his native country and wander in foreign lands. This was the religious disputation he was called upon to sustain, in 1263, in the presence of King James of Aragon, with the apostate Pablo Christiani. The latter, failing to make proselytes among the Jews of Provence, to whom he had been sent by his general Raymond de Penyaforte, requested King James to order Moses to take part in a public disputation. Relying upon the reserve his adversary would be forced to maintain through fear of wounding the feelings of the Christian dignitaries, Pablo assured the king that he could prove the Messianic claims of Jesus from the Talmud and other rabbinical writings. Moses complied with the order of the king, but stipulated that complete freedom of speech should be granted, and for four days (July 20-24) debated with Pablo Christiani in the presence of the king, the court, and many ecclesiastical dignitaries. The subjects discussed were three: (1) whether the Messiah had appeared; (2) whether the Messiah announced by the Prophets was to be considered as divine or as a man born of human parents; and (3) whether the Jews or the Christians were in possession of the true faith. From the start Moses disarmed his antagonist, whose arguments were based upon haggadic passages, by declaring that the Jew is bound to believe in the truth of the Bible, but in the exposition of the Talmud only in regard to points of religious practise; and that he is at liberty to reject the haggadic interpretations, which are only sermons expressing the individual opinions of the preacher, and do not possess authoritative weight. Then he went on to show that the Prophets regarded the Messiah as a man of flesh and blood, and not as a divinity, and that their promises of a reign of universal peace and justice had not yet been fulfilled. On the contrary, since the appearance of Jesus, the world had been filled with violence and injustice, and among all denominations the Christians were the most warlike. Further, the question of the Messiah is of less dogmatic importance to the Jews than the Christians imagine. The reason given by him for this bold statement, in which he was certainly sincere, since he repeats it in his treatise on redemption entitled "Ḳeẓ ha-Ge'ullah," is that it is more meritorious for the Jews to observe the precepts under a Christian ruler, while in exile and suffering humiliation and abuse, than under the rule of the Messiah, when every one would perforce act in accordance with the Law. As the disputation turned in favor of Moses the Jews of Barcelona, fearing the resentment of the Dominicans, entreated him to discontinue; but the king, whom Naḥmanides had acquainted with the apprehensions of the Jews, desired him to proceed. The controversy was therefore resumed, and concluded in a complete victory for Moses, who was dismissed by the king with a gift of three hundred maravedis as a mark of his respect. The Dominicans, nevertheless, claimed the victory, and Moses felt constrained to publish the controversy. From this publication Pablo selected certain passages which he construed as blasphemies against Christianity and denounced to his general Raymond de Penyaforte. A capital charge was then instituted, and a formal complaint against the work and its author was lodged with the king. James was obliged to entertain the charge, but, mistrusting the Dominican court, called an extraordinary commission, and ordered that the proceedings be conducted in his presence. Moses admitted that he had stated many things against Christianity, but he had written nothing which he had not used in his disputation in the presence of the king, who had granted him freedom of speech. The justice of his defense was recognized by the king and the commission, but to satisfy the Dominicans Moses was sentenced to exile for two years and his pamphlet was condemned to be burned. He was also fined, but this was remitted as a favor to Benveniste de Porta, Naḥmanides' brother (Jacobs, "Sources," p. 130). The Dominicans, however, found this punishment too mild and, through Pope Clement IV., they seem to have succeeded in turning the two years' exile into perpetual banishment. Moses left Aragon and sojourned for three years somewhere in Castile or in southern France. In 1267 he emigrated to Palestine, and, after a short stay in Jerusalem, settled at Acre, where he was very active in spreading Jewish learning, which was at that time very much neglected in the Holy Land. He gathered a circle of pupils around him, andpeople came in crowds, even from the district of the Euphrates, to hear him. Karaites, too, are said to have attended his lectures, among them being Aaron ben Joseph the Elder, who later became one of the greatest Karaite authorities. It was to arouse the interest of the Palestinian Jews in the exposition of the Bible that Moses wrote the greatest of his works, the above-mentioned commentary on the Pentateuch. Although surrounded by friends and pupils, Moses keenly felt the pangs of exile. "I left my family, I forsook my house. There, with my sons and daughters, the sweet, dear children I brought up at my knees, I left also my soul. My heart and my eyes will dwell with them forever." During his three years' stay in Palestine Naḥmanides maintained a correspondence with his native land, by means of which he endeavored to bring about a closer connection between Judea and Spain. Shortly after his arrival in Jerusalem he addressed a letter to his son Naḥman, in which he described the desolation of the Holy City, where there were at that time only two Jewish inhabitants—two brothers, dyers by trade. In a later letter from Acre he counsels his son to cultivate humility, which he considers to be the first of virtues. In another, addressed to his second son, who occupied an official position at the Castilian court, Moses recommends the recitation of the daily prayers and warns above all against immorality. 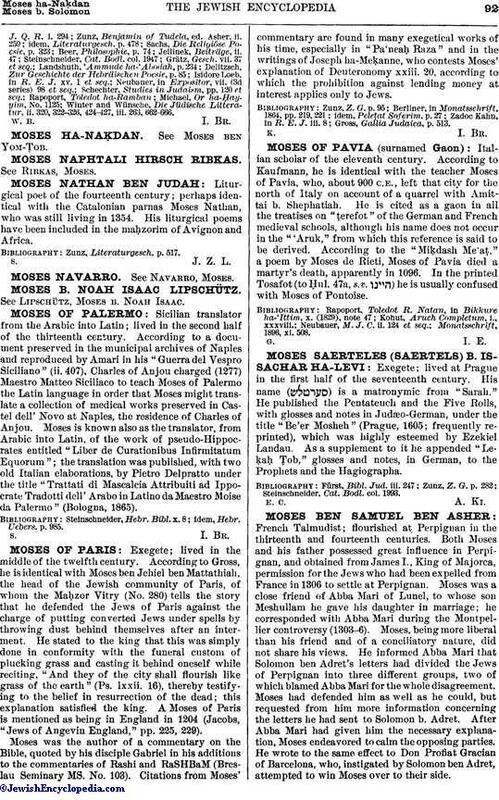 Moses died after having passed the age of seventy, and his remains were interred at Haifa, by the grave of Jehiel of Paris. 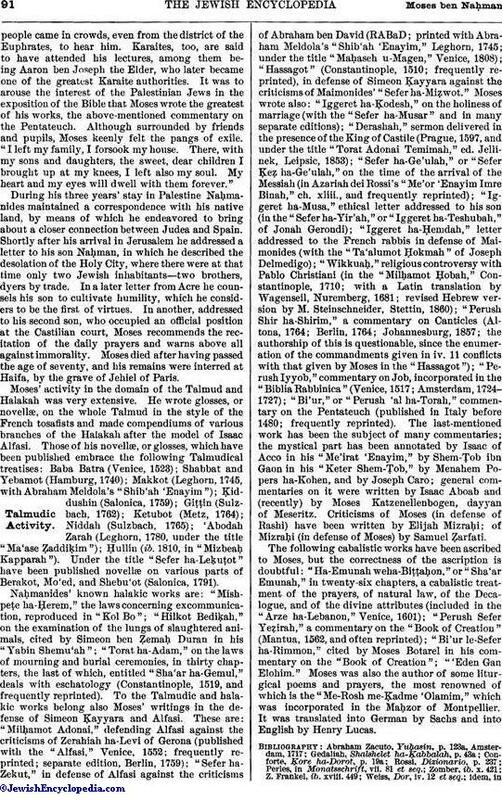 Moses' activity in the domain of the Talmud and Halakah was very extensive. He wrote glosses, or novellæ, on the whole Talmud in the style of the French tosafists and made compendiums of various branches of the Halakah after the model of Isaac Alfasi. 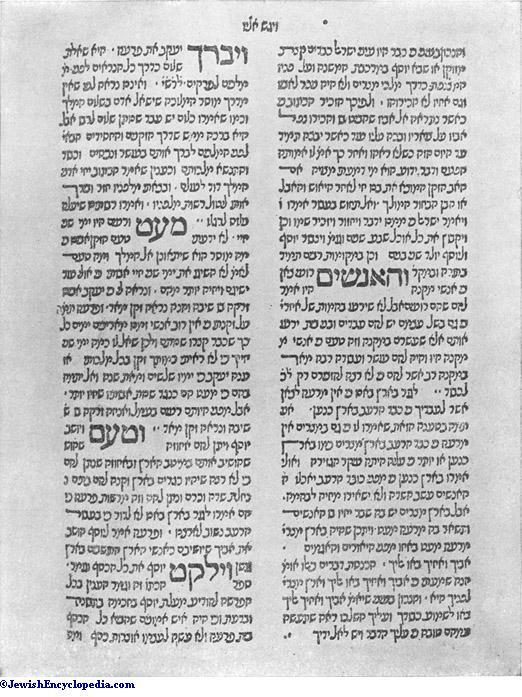 Those of his novellæ, or glosses, which have been published embrace the following Talmudical treatises: Baba Batra (Venice, 1523); Shabbat and Yeḅamot (Hamburg, 1740); Makkot (Leghorn, 1745, with Abraham Meldola's "Shib'ah 'Enayim"); Ḳiddushin (Salonica, 1759); Giṭṭin (Sulzbach, 1762); Ketubot (Metz, 1764); Niddah (Sulzbach, 1765); 'Abodah Zarah (Leghorn, 1780, under the title "Ma'ase Ẓaddiḳim"); Ḥullin (ib. 1810, in "Mizbeaḥ Kapparah"). Under the title "Sefer ha-Leḳuṭot", have been published novellæ on various parts of Berakot, Mo'ed, and Shebu'ot (Salonica, 1791). Naḥmanides' known halakic works are: "Mishpeṭe ha-Ḥerem," the laws concerning excommunication, reproduced in "Kol Bo"; "Hilkot Bediḳah," on the examination of the lungs of slaughtered animals, cited by Simeon ben Ẓemaḥ Duran in his "Yabin Shemu'ah"; "Torat ha-Adam," on the laws of mourning and burial ceremonies, in thirty chapters, the last of which, entitled "Sha'ar ha-Gemul," deals with eschatology (Constantinople, 1519, and frequently reprinted). To the Talmudic and halakic works belong also Moses' writings in the defense of Simeon Ḳayyara and Alfasi. These are: "Milḥamot Adonai," defending Alfasi against the criticisms of Zerahiah ha-Levi of Gerona (published with the "Alfasi," Venice, 1552; frequently reprinted; separate edition, Berlin, 1759); "Sefer ha-Zekut," in defense of Alfasi against the criticisms of Abraham ben David (RABaD; printed with Abraham Meldola's "Shib'ah 'Enayim," Leghorn, 1745; under the title "Maḥaseh u-Magen," Venice, 1808); "Hassagot" (Constantinople, 1510; frequently reprinted), in defense of Simeon Ḳayyara against the criticisms of Maimonides' "Sefer ha-Miḥwot." Moses wrote also: "Iggeret ha-Ḳodesh," on the holiness of marriage (with the "Sefer ha-Musar" and in many separate editions); "Derashah," sermon delivered in the presence of the King of Castile (Prague, 1597, and under the title "Torat Adonai Temimah," ed. 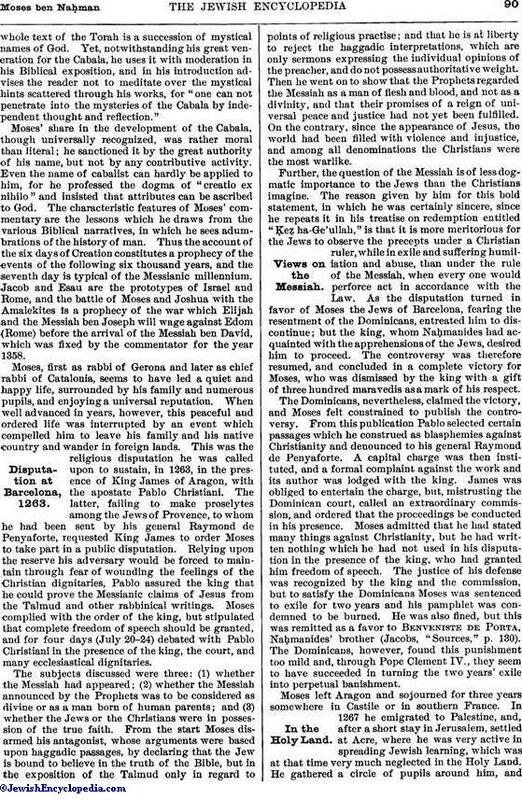 Jellinek, Leipsic, 1853); "Sefer ha-Ge'ulah," or "Sefer Ḳeẓ ha-Ge'ulah," on the time of the arrival of the Messiah (in Azariah dei Rossi's "Me'or 'Enayim Imre Binah," ch. xliii., and frequently reprinted); "Iggeret ha-Musa," ethical letter addressed to his son (in the "Sefer ha-Yir'ah," or "Iggeret ha-Teshubah," of Jonah Gerondi); "Iggeret ha-Ḥemdah," letter addressed to the French rabbis in defense of Maimonides (with the "Ta'alumot Ḥokmah" of Joseph Delmedigo); "Wikkuaḥ," religious controversy with Pablo Christiani (in the "Milḥamot Ḥobah," Constantinople, 1710; with a Latin translation by Wagenseil, Nuremberg, 1681; revised Hebrew version by M. Steinschneider, Stettin, 1860); "Perush Shir ha-Shirim," a commentary on Canticles (Altona, 1764; Berlin, 1764; Johannesburg, 1857; the authorship of this is questionable, since the enumeration of the commandments given in iv. 11 conflicts with that given by Moses in the "Hassagot"); "Perush Iyyob," commentary on Job, incorporated in the "Biblia Rabbinica" (Venice, 1517; Amsterdam, 1724-1727); "Bi'ur," or "Perush 'al ha-Torah," commentary on the Pentateuch (published in Italy before 1480; frequently reprinted). The last-mentioned work has been the subject of many commentaries; the mystical part has been annotated by Isaac of Acco in his "Me'irat 'Enayim," by Shem-Ṭob ibn Gaon in his "Keter Shem-Ṭob," by Menahem Popers ha-Kohen, and by Joseph Caro; general commentaries on it were written by Isaac Aboab and (recently) by Moses Katzenellenbogen, dayyan of Meseritz. Criticisms of Moses (in defense of Rashi) have been written by Elijah Mizraḥi; of Mizraḥi (in defense of Moses) by Samuel Ẓarfati. The following cabalistic works have been ascribed to Moses, but the correctness of the ascription is doubtful: "Ha-Emunah weha-Biṭṭaḥon," or "Sha'ar Emunah," in twenty-six chapters, a cabalistic treatment of the prayers, of natural law, of the Decalogue, and of the divine attributes (included in the "Arze ha-Lebanon," Venice, 1601); "Perush Sefer Yeẓirah," a commentary on the "Book of Creation" (Mantua, 1562, and often reprinted); "Bi'ur le-Sefer ha-Rimmon," cited by Moses Botarel in his commentary on the "Book of Creation"; "Eden Gan Elohim." Moses was also the author of some liturgical poems and prayers, the most renowned of which is the "Me-Rosh me-Ḳadme 'Olamim," which was incorporated in the Maḥzor of Montpellier. It was translated into German by Sachs and into English by Henry Lucas. Winter and Wünsche, Die Jüdische Litteratur, ii. 320, 322-326, 424-427, iii. 263, 662-666.